A prerequisite of performing any martial art is that the body of the practitioner is in a relaxed state of openness and moves in integrated harmony. However, to attain a state of what seems sublime, natural relaxation is in fact the life’s work of many high level martial artists and something which forms the fundamental part of their training. Each system will have its own very specific set of basic foundation exercises, which correspond to that particular system’s characteristics and movements; for Ba Gua, there will be a lot of coiling and spiraling work, to enable the practitioner to loosen, elongate and relax the spine; Xing-Yi incorporates a lot of single movement training and holding post; Taiji also practices many standing postures and expansive “energy cultivation” moves.??? Even so, for many practitioners, there are still many areas of the body that they feel are not “opened” or don’t have a sense of sufficient harnessing of the power and energy, and which for some reason or other just don’t seem to be cultivated through their particular systems’ specialized exercises. To combat this problem, some practitioners take to cross-training or even simply change disciplines, in order to try and reach their potential or take their practice to a new level. However, Master Shou Guan Shun of Shanghai believes that rather than change forms or change disciplines, the problem lies more in finding the right basic foundation exercise system. Master Shou, who recently completed a successful seminar tour around the UK, organized and sponsored by Double Dragon Alliance, is a Sun Stylist and Xing-Yi practitioner of nearly 50 years experience. Born in 1948, he hardly looks his 63 years of age and has the energy and power of a much younger man, which he attributes directly to his foundation exercises and Grandmaster Sun’s Daoist Neigong and Qigong practices. 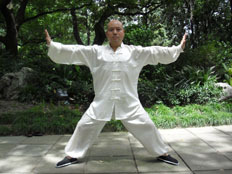 His Xing-Yi, Ba Gua and Sun Style Taiji lineage is from Sun Lu Tang, via Zhi Xie Tang (a disciple of Sun Lu Tang), with whom he studied from 1964 – 1973 and Master Shou is a 3rd generation lineage holder of Grandmaster Sun’s Xing-Yi and Daoist internal practices of Quan Yu Dao. Coming from this lineage he says, enabled him to further develop the foundation exercises necessary for students to be able to correctly open, align and energize their bodies, thus facilitating form practice and application usage. Master Shou believes the reason why many students feel frustration that they cannot actually “use” their forms in push hands or sparring, is not necessarily because of inadequate knowledge of the techniques or lack of “hands-on” practice. In fact, he suggests there is often more an inability to correctly utilize the inherent power within our own bodies and insufficient knowledge of how to correctly integrate, manoeuvre and combine the successive movements of our bodies, executing each part of the application in a flowing and natural sequence with the correct timing, which takes advantage of the opponent’s power, whilst utilizing our own minimal effort. Master Shou stresses, the first and most important element involved in learning technique usage and form, is the state of the practitioner’s own body and in the understanding of the energy. For many practitioners (western and Chinese), he feels that the main difficulty we face is that our bodies are not “open” and “relaxed” enough; either being excessively rigid and tense, or to the other extreme of complete floppiness, with no outward form or shape. In Chinese, “顶 – Ding - go against or resist, or 丢- Diu – collapsed or lost”. In Chinese terminology, relaxed is translated as “放松 – Fang Song” and open as “松开 – Song Kai”. But for practitioners, the difficulty for both Chinese and westerners alike is in understanding these concepts, rather than these words. In Chinese language, the “words” depict pictures, states, concepts or feelings; rather than a more one dimensional academic idea; so it’s important for a student to first recognize and experience what is the state of “relaxed and open”, rather than to just intellectualize it. 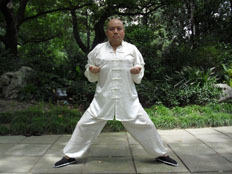 Master Shou teaches all his martial arts’ students and the elderly residents who come to him for regular health exercise and treatment, a set of foundation and body opening exercises called, “Elongate the sinews and open the joints”, (伸筋拔骨 – Shen Jin Ba Gu). The series of exercises are designed to specifically stretch, open, relax and energize the individual segments and joints of the body, in particular the shoulders and arms, hips and legs and the entire length of the spine. The major problem students face in their practice, is the accumulation of tension in the neck, shoulders and spine, from years of either incorrect postural habits, work related postures or stress and tension caused by 21st Century living! The set at first appears very simple, but the more one practices it, the more one detects hidden information and benefits, as one always seems to do in martial arts practice. The first section of the movements work specifically on opening the shoulders and elongating the tendons and muscles through the arms; the practitioner must stretch along the entire length of both arms, from fingertip to fingertip, whilst at the same time concentrating on expanding the internal size and range of movement of the ball and socket joints of the shoulders. As in all internal martial arts, what is “actioned” in the shoulders and arms, is also mirrored in the hips and legs; although this part of the system may not be felt so strongly by beginners to the set, but the longer one practices, the more one can feel the internal and external harmonies coming into play. There are a variety of different hand postures; palms facing away vertically from the body, palms facing straight downwards, “hook” or “beaked” hands, with fingers pointing in different directions; all of which are designed to open and stretch different muscles, tendons and ligaments and activate minutely the entire surface area within the shoulder joint, thus facilitating real control and sensitivity of the shoulder girdle and shoulder joint. 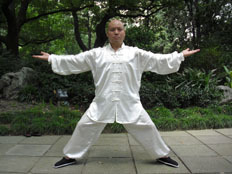 After the initial set of hand movements, which are all performed in a wide open stance, with a slight concave arch in the waist area, as opposed to the “Ming Men – 命门 “ being rounded and protruding; the feet are brought together and the next sequence particularly for the spine (from the head to the tailbone), is worked through. In this series, first with the arms extending downwards and the head tilted back, the spine, in particular the neck vertebrae, are opened and elongated, following with a movement with the arms extended upwards either side of the head. With so many people now suffering from neck pain, rounded shoulders and “widows humps” from looking at computers and other job-related fixed postures, this opening of the neck gives it a much needed release from the tension it usually carries and allows the blood supply and according to TCM, the “Qi Xue – 气血” or nourishment and energy within the blood, to?be carried up to invigorate and replenish the blood supply of the brain, helping to prevent all manner of conditions and potential ailments, like high and low blood pressure, poor memory and strokes among others, in addition to simply optimizing the function of the brain and related nervous system. After gathering and re-centering positive, fresh energy and releasing the stagnant qi, the practitioner now executes a series of postures and low stances, designed to open the hips and strengthen the root and legs. Again, as in the upper body set, correct posture and alignment are necessary, and Master Shou when teaching the set, also reiterates the relationship between the movements and their functions within push hands and form. In fact, when the postures are executed correctly, the practitioner creates such a strong and “alive” root, that they cannot be pulled out from their root, making them completely solid, yet not “dead” or static, just like a fixed piece of wood merely stuck in the ground. The lower body set are at first quite demanding and beginners must understand the correct alignment and requirements, but there are very quick and rewarding results for one’s practice if the set is practiced daily. Like the upper body sequence, the lower body set also aims to stretch and elongate and open the whole circumference of the ball and socket joint of the hip, as well as releasing and opening the pelvic girdle, which ultimately allows the energy to pass through to the feet, thus connecting and harmonizing the entire body, turning it into an entity where the power is distributed fully and evenly; allowing the power and energy to be maximized several fold. Master Shou has refined and honed this set over several decades of practice and during the seminars in the UK, taught it in great detail to a very diverse and appreciative group of participants. He said the set can benefit martial artists of all disciplines, no matter their style, as it allows the practitioner to integrate and connect the body in a relaxed way, culminating in greater range of motion and allowing the power and energy to be transmitted to the extremities; whilst at the same time being also appropriate for practice by all levels of practitioners and health states; as the set optimizes the body’s movements in a natural way, stimulating blood circulation, allowing greater freedom and range of movement, freeing the tension within the body, helping to prevent calcification and freezing of joints and providing the practitioner with a sense of well-being and relaxation. Master Shou, who is also a great push hands proponent, explains how we can apply the Shen Jin Ba Gu principles to push hands practice, as the stretching and elongation achieved, allow the practitioner to comply with Taiji principles set down by Wang Zhong Yue: “Countering a force rising upward, you become higher; Confronting a force sinking downward you become lower”.?????? Pushing hands practice was how Master Shou first met his Yang Style teacher, Master Rao Shao Ping. Master Shou’s Yang Style Taiji lineage is from Yang Cheng Fu, via Wu Hui Chuan to Master Shou’s teacher Master Rao Shao Ping, with whom he studied for over 14 years. Master Rao was himself a very well respected Yang Stylist from Shanghai and a contemporary of such greats as Feng Zhi Qiang and Zhang Yu. Master Shou studied daily with Master Rao for around 8 hours in total everyday, (at this time he didn’t have a “day job”) concentrating on Yang Style push hands and applications, as well as the form. Master Shou said his teacher’s specialties were the correct combination and coordination of the body with the discharge of power and the subtle changes of the hands and contact points to be able to issue energy in a soft, relaxed and yet powerful way. I personally met Master Shou over 9 years ago in Shanghai and having worked with him closely both in Shanghai and in the UK, I can appreciate not only how important a master’s level is, but more importantly, how clearly and detailed their instruction must be. Watching Master Shou taking the students through the A, B, C’s of how to harmonize the body and physical movements with the execution of each technique, so as to make transitions between movements and applications, smooth and effortless, one can really appreciate not only the beauty of Taiji as a martial art, but also its simplicity and effectiveness. Using foundation exercises like the Shen Jin Ba Gu as building blocks for our training, definitely brings students much closer to achieving the feelings and abilities we read about in books and articles on martial arts and achieving our own practice goals and of “entering the portals of really knowing their chosen art”, or as they say in Chinese “入门 – Ru Men”, which literally translated means “pass through the entrance gate”. ?